Happy New Year to all our blog followers! 2011 was an amazing year for us and set many foundations down for the future and now that we’re well and truly plonked in 2012 it’s natural that we look towards the next twelve months. Whatever happens this year around the world (we’re hoping those pesky Mayans did their mathematics wrong), one thing is for certain, 2012 is The Year of the Gamebook! Why such a bold statement? Well basically there is such a positive buzz around interactive fiction at the moment that hasn’t been seen since the 1980s and early 90s when CYOA and Fighting Fantasy books were scattered across the bookshelves in many book shops and libraries. While there will be an increase in the printed form this year, it is the rise of electronic handheld reading devices in the shape of smart phones and tablets that is really building this renaissance. It is now the perfect time for interactive storytelling to shine! It’s hard to believe that Warlock of Firetop Mountain was first published in August 1982 – makes us feel so old! It still sells well, especially having a recent iOS resurgence and as all gamebook know-it-alls will tell you, it went on to spawn the epic Fighting Fantasy series by Ian Livingstone and Steve Jackson. It’s safe to make the claim that Fighting Fantasy is the grand-daddy of fantasy gamebooks especially when it comes to the addition of D&D style RPG elements such as character creation and dice rolling, with classics such as Deathtrap Dungeon, Forest of Doom and House of Hell (as well as seven great titles written by our very own Jonathan Green no less!). 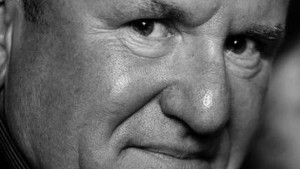 With 2012 being the 30th anniversary of publication of Warlock, Ian Livingstone decided to pick up his pen again and write a brand new adventure, which will be released in August, exactly 30 years on! No-one quite knows what the adventure entails and no beans were spilled when Neil was lucky enough to meet Ian at Dragonmeet in November last year. Whatever the adventure holds, we’re sure it will be a great read and exactly what you’d expect from a classic FF gamebook! As an extra note, James Wallis hosted a great interview with Ian Livingstone at Dragonmeet, which can be heard here. Ian even namedrops us at one point which obviously made us feel all warm and fuzzy inside! If you’ve been following our Tin Man antics you’ll be well aware that we were very excited to snag the license to create gamebooks based on Judge Dredd and 2000AD. 2012 is a huge year for Judge Dredd with some high profile comic stories coming out as well as the movie later this year starring Eomer (LOTR) and Bones (Star Trek) actor, Karl Urban. We really do believe that this year is the perfect time to bring Dredd to the gamebook format and the app is currently in full developement. All those perps in Mega-City One better keep their eyes peeled as YOU will be playing as the famous futuristic lawman in an epic storyline! We’ll slowly start revealing more information about our Judge Dredd gamebook over the next couple of months. Be ready for an awesome ride on the Lawmaster! There are some amazing a passionate gamebook folk out there. During 2011 there was a definite increase in gamebook discussion had on public blogs. About 3 years ago most gamebook fans had to resort to joining Yahoo groups for their gamebook fix, but now it seems many people want to share their hobby out in the open. One of the biggest champions in this area is Stuart Lloyd, who is constantly blogging and contributing to online community – a top bloke! Recently he joined forces with our very own GA writer, Andrew Wright, to create the excellent Lone Tiger Gamebook Reviews blog. To anyone out there blogging about gamebooks, we’re going to compile our very own blog post later this year with them all on, so please let us know if you’re not on our radar – although we probably know most of you now! Lone Wolf is one of the other printed fantasy gamebook brands from the 80s and 90s that has been popular around the world. It was originally designed by Joe Dever and Gary Chalk, with Gary creating all the illustrations for the first set of books. 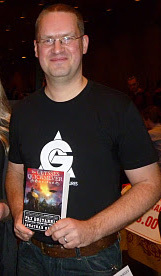 Gary has been away from the gamebook scene for a while, but we’re honoured to have him work with Greywood Publishing and ourselves on a new series called Gun Dogs! Gary has a very distinctive art style and brings back many nostalgic gamebook memories for us. Speaking of Lone Wolf, it was announced earlier this year that a PC version of the Lone Wolf is currently in development. It’s slated for a 2013 release, but we’re sure there will be a fair bit of promotion for this over the next year. Also rumoured to be iOS and Android versions in the works too, which is fine by us – it’s good to have healthy competition and it’s heartening to feel that GA is sitting alongside classics like Lone Wolf! Fighting Fantasy will also be making further appearances on Kindle (and I also see that Worldweaver have been working on Lone Wolf too) and the awesome Laughing Jackal team will be bringing Warlock of Firetop Mountain to PSP and PSN after their successful debut with Talisman of Death! It’s also worth noting here that we’ll be bringing Gamebook Adventures to PC and Mac desktop users this year too! After writing the amazing Temple of the Spider God, which was critically acclaimed, we just had to snap Jon up for some more Gamebook Adventures! We have two massive projects lined up with him this year. The first of which is an idea that Jon actually proposed to us, which we instantly fell in love with. The best way to describe it would be a cross between Indiana Jones, Metal gear Solid and perhaps a smidgeon of Thunderbirds thrown in for good measure. We can’t say too much more about it at the moment, but rest assured we’ll be jibbering about it on this blog before long! 9) Supernatural Romance hots up! It’s been a general rule in gamebooks that they need to be testosterone heavy with action and blood splattering death and we feel it’s about time to take Gamebook Adventures into a whole new genre – romance! The team over at Choice of Games have released some great interactive romance-based books over the last year or two (we’re big fans of these guys – check them out) and from chatting to people at events like PAX, there is a genuine want for this kind of interactive fiction. We’ve had a crack team of writers over in the States led by Miellyn Fitzwater-Barrows busy putting together a series which we will be debuting this year! Expect vampires, changelings, magic and more than enough steamy romance to get you all hot under the collar! I agree with all of your points Neil. And I hope that you do explore other interactive stories that do not necessarily have to rely on frequent combat/dice rolling. I would be fine with a story that has little or no combat at all, like a Choose-Your-Own-Adventure book, and you could still use dice rolling and RPG stats to determine lots of other variables in the story, when needed. I wish you the greatest success as you continue to develop Orlandes and your other original intellectual property. They are great fun. Any type of RPG or sci-fi/fantasy TV series or movie or videogame that is not using gamebooks or novels or graphic novels to cross-promote their product is really missing out. Even the guys behind the iOS game Infinity Blade went out and hired a great fantasy writer to release a novel in e-book format to strengthen and expand the back story behind their game. Some very kind comments about the magazine there Neil! I warmly thank you for all you’ve done to bring it to the attention of the RPG community via this blog. Long may GA continue to do well and bring the light of gamebooks to the darkness that swallows those who’ve never played them! That is great news indeed Neil. Thank you for the reply. Great! Hopefully be Android ready by the middle of the year. Hi Neil, any updates on Jon Green’s Drymar Gamebook? I’m really really looking forward to that. Love your guys’ work – GA are my favorite iPad games.